It is not known when Handel's Flute sonata in E minor for flute and continuo, HWV 375, was composed, but it was first published in 1730. It is sometimes referred to as “Halle Sonata No. 2”, following the assumption that it was an early work, composed during Handel's boyhood in Halle, before 1703. 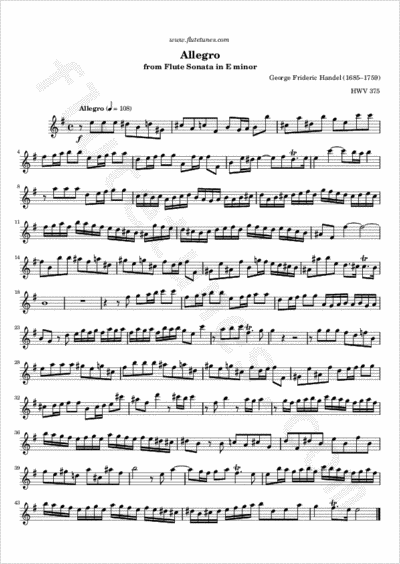 This cannot be true for this particular sonata, however, because the second movement (which we present today) is a transposition into E minor of the Allegro from Handel's Sonata for oboe in C minor, HWV 366, which dates from 1711–12. Thanks to Ines for suggesting this piece!